Canada’s Economic Action Plan, it appears, doesn’t reach Baddeck. In that picturesque village, federal agents are trying to kill an iconic small business oriented towards a US market—and that after decades of government investment and effort to strengthen and grow such businesses in chronically jobless Cape Breton. The business is the Cape Breton Boatyard, created in 1937 to serve the fleet of yachts associated with the family of Alexander Graham Bell and their friends, and owned for the past several decades by Henry Fuller. Since the beginning, the main clientele of the boatyard has been visiting yachts from the US, which cruised the Bras d’Or Lakes in the summer and were stored at the yard in the winter. The yard also provided a starting point for many spectacular voyages to northern destinations ranging from Newfoundland and Labrador to Greenland and Iceland—so the Cape Breton Boatyard appears in many notable books by famous sailing authors. In theory, US boats are not supposed to overwinter in Canada without being legally imported and paying taxes and duty. But there’s an exception. If a boat needs repairs, it may stay—and the repairs, maintenance and storage of such yachts has been the core business of the Cape Breton Boat Yard. And though the necessary “repairs” may not have been very extensive, customs officers have never been very exacting about the matter. That made sense. Nova Scotia is a hard place to get to from the US, an upwind slog for days and weeks on end. Given the brevity of our sailing season, a cruise to, say, Labrador or northern Newfoundland and back to the States is barely possible to accomplish within a single season. 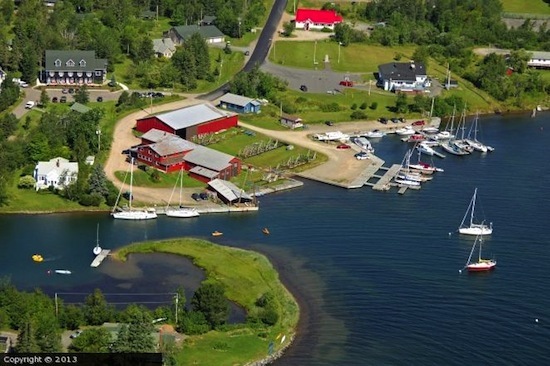 And the extended presence of American yachts and their crews in Baddeck has been a boon to the entire community. That’s what tourism is supposed to do for us—and for decades, it did. Nova Scotia is trying to attract more high-end tourists, and there are no higher-end tourists than these. Our policies should reflect that. Instead of creating a sensible policy, however, the ill-named Canada Border Services—which provide more nuisances than services—has always just taken a generous interpretation of the requirement for “repairs.” That left everyone vulnerable to the possibility that some officious twit might suddenly decide to enforce the letter of the law, and require that US boats either be legally imported—at huge cost—or leave the country. And that’s exactly what’s happening right now. After assuring Henry Fuller in June that—despite worrisome rumours—no enforcement changes were planned, the customs service has now, at the very end of the season, announced it will enforce the letter of the law. US yachtsmen must leave Nova Scotia, or pay punitive duties and taxes on their boats—in some cases, as much as $450,000. It’s not easy for them to leave. Many have already mothballed their boats and gone home to the States, and those who do choose to leave face either an $8-10,000 trucking bill or a voyage of 1000 miles or more in the open Atlantic in the heart of the hurricane season. Not only have the feds made a unilateral policy change, they’ve done it in the most damaging possible way. And imagine if the Americans retaliate. How many Canadian boats, motorhomes and fifth-wheel trailers are left more or less permanently in Florida, Arizona, California? How would our retirees deal with a peremptory demand to remove them? If this decision is allowed to stand, Henry Fuller’s business—and the 5-7 jobs it supports—are gone. And the message this sends to our US visitors is appalling. Canada is not a reasonable, congenial place to visit; it’s an unpredictable banana republic. For a government that prizes economic health above everything else, this is incomprehensible. Nova Scotia’s business community, and its provincial government, should be protesting this decision in the strongest terms—and demanding that the feds explain how the destruction of a fine little business in a depressed part of the country fits into Canada’s vaunted Economic Action Plan.